Strong associations of adverse perinatal outcomes have been identified with later cardiovascular disease in the mother. Few studies have addressed associations with kidney disease. This study investigated whether perinatal outcomes are associated with later clinical kidney disease as diagnosed by kidney biopsy. The Medical Birth Registry of Norway contains data on all childbirths in Norway since 1967. The Norwegian Kidney Biopsy Registry contains data on all kidney biopsies in Norway since 1988. All women with a first singleton delivery from 1967 to 1998 were included. Pregnancy-related predictors of later kidney biopsy were analyzed by Cox regression analyses. A total of 756,420 women were included, and after a mean period of 15.9 ± 9.4 yr, 588 had a kidney biopsy. Compared with women without preeclampsia and with offspring with birth weight of ≥2.5 kg, women with no preeclampsia and with offspring with birth weight of 1.5 to 2.5 kg had a relative risk (RR) for a later kidney biopsy of 1.7, women with no preeclampsia and with offspring with birth weight of <1.5 kg had an RR of 2.9, women with preeclampsia and with offspring with a birth weight of ≥2.5 kg had an RR of 2.5, women with preeclampsia and with offspring with a birth weight of 1.5 to 2.5 kg had an RR of 4.5, and women with preeclampsia and with offspring with a birth weight of <1.5 kg had an RR of 17. Similar results were found in adjusted analyses and after exclusion of women with diabetes, kidney disease, or rheumatic disease before pregnancy. The same risk patterns applied to any of the specific categories of kidney disease as well as specific kidney diseases investigated. Women who have preeclampsia and give birth to offspring with low birth weight and short gestation have a substantially increased risk for having a later kidney biopsy. Large studies have shown an increased risk for cardiovascular disease in mothers of low birth weight (LBW) offspring (1). In addition, preeclampsia and offspring of short gestation are associated with an increased maternal risk for cardiovascular disease (1,2). Preeclampsia and placental dysfunction therefore have been hypothesized as early indicators of later maternal cardiovascular disease. Kidney disease and cardiovascular disease are strongly linked in terms of risk factors also associated with constituents of the metabolic syndrome, but no large population studies have investigated whether kidney disease is associated with adverse perinatal outcome. Studies have demonstrated, however, persistent microalbuminuria after preeclampsia for up to 5 yr in 20 to 40% (3,4). As microalbuminuria is a widely known cardiovascular as well as renal risk factor, preeclampsia may be associated with kidney disease. In addition, rheumatic diseases such as maternal systemic lupus erythematosus and rheumatoid arthritis are associated with glomerular diseases, preeclampsia, and LBW offspring (5–8). There are reasons to believe, therefore, that LBW offspring and preeclampsia are associated with later clinical kidney disease in the mother, but few studies have investigated this hypothesis. Since 1967, extensive data on all childbirths have been recorded in the Medical Birth Registry of Norway, and data on all kidney biopsies since April 1988 have been recorded in the Norwegian Kidney Biopsy Registry. We have linked these two registries to investigate whether adverse perinatal outcomes increase later risk for the mother’s developing a kidney disease that will be examined by a kidney biopsy. We also investigated how adverse perinatal outcomes are associated with different categories of kidney disease as well as specific kidney diseases. Since 1967, medical data on all childbirths in Norway (total population of 4.5 million inhabitants) that had a gestational age of at least 16 wk have been forwarded, by compulsory notification, to the Medical Birth Registry of Norway (9). The registry notification form, largely unchanged from 1967 to 1998, includes extensive data on maternal disease, complications of delivery, and conditions of the newborn infant. The form is completed by the attending midwife and doctor and was from 1967 to 1998 coded at the registry using the International Classification of Diseases, Eighth Revision (ICD-8). The Norwegian Kidney Biopsy Registry comprises clinical and histopathologic data on virtually all patients with a kidney biopsy in Norway since April 1988. The responsible physicians report clinical data in a registry notification form. The nephropathologic department at Haukeland University Hospital reports histopathologic data after a thorough examination of the kidney biopsies, providing a consistent diagnosis in all patients. In general, most patients in Norway will have a kidney biopsy performed when they have proteinuria >1 g/24 h or serum creatinine >150 μmol/L and renal parenchymal disease is suspected. We included all first singleton deliveries between 1967 and 1998. Data on these women that were recorded in the Medical Birth Registry of Norway were linked with the Norwegian Kidney Biopsy Registry using the national identification number. The outcome was defined as having a kidney biopsy performed, as well as type of kidney disease, and the time of end point was the date of the kidney biopsy. Women with no kidney biopsy were followed until December 31, 2002. In our study, no data were available on subject survival; therefore, subject death could not be used as a censoring event. Marital status was recorded as either single (divorced or not living with partner) or not single (married or living with partner). Gestational hypertension has been defined as a BP of ≥140/90 mmHg or increase in diastolic BP of at least 15 mmHg or systolic BP of at least 30 mmHg from the woman’s average BP before 20 wk of gestation (ICD-8 diagnoses 637.0 and 637.2). In our study, those who developed preeclampsia were not part of the gestational hypertension group. Preeclampsia has been defined as increased BP after 20 wk of gestation with proteinuria (ICD-8 diagnoses 637.4, 637.5, 637.6, and 637.9). Maternal kidney disease was present when one or more of the following diagnoses had been made before pregnancy: A chronic history of nephrotic syndrome, nephritis, or other diseases of the kidney or ureters (ICD-8 diagnoses 581, 582, 583, 584, and 593). Maternal rheumatic disease was defined as connective tissue disease or inflammatory arthritides before pregnancy (ICD-8 diagnoses 712, 715, 716, and 734). Birth weight is measured shortly after birth, and gestational age is based on the last menstrual period. Offspring with birth weight less than the 10th percentile for their gestational age is regarded as small for gestational age. The infant was recorded as stillborn when it died before or during labor. The kidney biopsy diagnoses of glomerular diseases were made in accordance with the criteria given in the World Health Organization monographs of kidney disease (10). In this study, we focused on glomerular diseases because tubulointerstitial and vascular diseases are more difficult to classify in kidney biopsy registries. We found it necessary to keep the number of subgroups to a minimum to analyze the data effectively. Consequently, the results of the kidney biopsies were classified into the following five categories: (1) Mesangioproliferative glomerulonephritis (MPGN), (2) other immune complex GN (including membranous GN, endocapillary GN, or GN associated with systemic lupus erythematosus), (3) focal and segmental glomerulosclerosis (FSGS) or minimal-change disease (MCD), (4) other pathologic findings at kidney biopsy (acute or chronic interstitial nephritis, benign nephrosclerosis, diabetic nephropathy, vasculitis, thrombotic microangiopathy, crescentic GN, or other rare kidney diseases), and (5) normal findings at kidney biopsy or unrepresentative biopsy specimen. Data were analyzed in a cohort design with the pregnancy-related variables as exposure and kidney biopsy or type of kidney disease as outcome variables. Relative risk (RR) estimates for a later kidney biopsy associated with selected risk factors were obtained by Cox regression analyses. Most of the analyses were adjusted for year of childbirth and maternal age, but the main results were also tested for more extensive adjustment models. The assumption of proportional hazards was tested with covariate adjusted log-log plots; the assumption was met. Because no kidney biopsies had been registered between 1967 and April 1988, mothers who gave birth during this period were left censored in the survival analyses before April 1988. The counting process of proportional hazards by Andersen and Gill (11) therefore was applied. This method does not include mothers in the analyses until an event could be registered, e.g., a mother who gave birth in 1978 would be included in the analyses 10 yr after childbirth and right censored 24 yr after childbirth in the event of no kidney biopsy. The analyses were performed with the statistical packages SPSS 11.5 (SPSS Inc., Chicago, IL) and S-Plus 6.0 (Insightful Corporation, Seattle, WA). P < 0.05 was considered statistically significant; all tests were two tailed, and P values were tested for trend for ordinal categorical variables. From 1967 to 1998, 756,420 women gave birth to their first singleton child, who was registered in the Medical Birth Registry. From April 1988 to December 31, 2002, 588 of these had a kidney biopsy. Among these women, mean age at childbirth was 24.1 ± 4.5 yr (range 11 to 50 yr) and at biopsy was 40.8 ± 9.6 yr (range 18 to 69 yr). A total of 261,698 (34.6%) women gave birth after April 1988, among whom 142 had a kidney biopsy after a mean follow-up of 9.9 ± 3.1 yr. The remaining 494,722 (65.4%) women gave birth before April 1988, and 446 of them had a kidney biopsy from April 1988 to December 2002. At the time of childbirth, 19% of the 756,420 women were not living with a partner or were divorced, whereas 81% were married or living with a partner. After 5, 10, 20, and 30 yr of follow-up, 0.032, 0.056, 0.11, and 0.18% of the women had had a kidney biopsy. The annual rates of a kidney biopsy did not change significantly during this period. The numbers of women in subgroups according to pregnancy-related variables and categories of kidney disease are shown in Table 1. Increased RR for a later kidney biopsy were observed for LBW offspring; offspring with short gestation; preeclampsia, diabetes, chronic kidney disease (CKD), and rheumatic disease before pregnancy (Table 2). From April 1988 to 1998, complete registration of end points was obtained; we therefore performed separate analyses of this subgroup, yielding similar findings as those for women who gave birth from 1967 to 1998 (Table 2). RR, however, were higher for LBW, short gestation, and preeclampsia and indicated that these factors were especially important during the first 5 yr after childbirth (Table 2 and Figure 1). However, in analyses in which biopsies during the first 5 yr after childbirth were excluded, the effects of LBW, short gestation, and preeclampsia were lower but still statistically significant (RR associated with <1.5 kg, 1.5 to 2.5 kg, <32 wk, 32 to 36 wk, and pre-eclampsia were 2.7, 1.8, 1.9, 1.4, and 2.0, respectively). RR for diabetes, CKD, and rheumatic disease were identical to those in the main analyses. Separate analyses of women without diabetes, CKD, and rheumatic disease before pregnancy yielded almost identical results (Table 2). Cumulative risk for having a kidney biopsy according to pregnancy-related variables. Norway, childbirths 1967 to 1998 and kidney biopsies 1988 to 2002. To assess further the association between preeclampsia and offspring birth weight on the one hand and later kidney biopsy on the other, we performed stratified analyses of preeclampsia and birth weight. 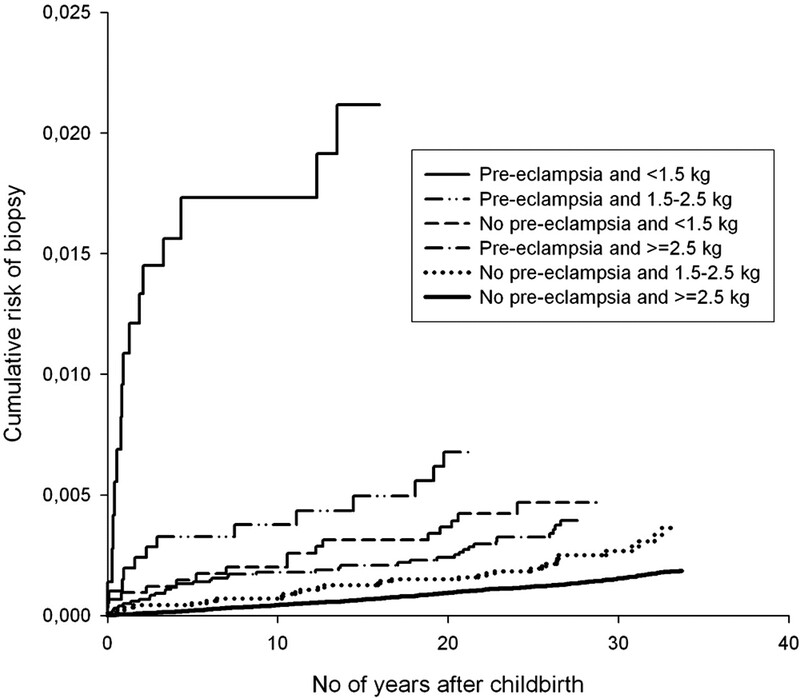 Compared with women without preeclampsia and with offspring with birth weight of ≥2.5 kg, women with no preeclampsia and with offspring with birth weight of 1.5 to 2.5 kg had an RR for a later kidney biopsy of 1.8, women with no preeclampsia and with offspring with birth weight of <1.5 kg had an RR of 2.8, women with preeclampsia and with offspring with birth weight of ≥2.5 kg had an RR of 2.4, women with preeclampsia and with offspring with birth weight of 1.5 to 2.5 kg had an RR of 4.8, and women with preeclampsia and with offspring with birth weight of <1.5 kg had an RR of 17 (Table 3 and Figure 2). Adjustments for maternal age, year of childbirth, marital status, small for gestational age offspring, and stillbirth yielded virtually identical results. Adjustment for offspring gestational age decreased the RR associated with offspring birth weight even though the RR remained highly significant. The analyses in Table 3 were repeated for preeclampsia and gestational age (using 32 and 37 wk as cutoffs) with virtually identical results, although offspring birth weight seemed to be a stronger risk factor than offspring gestational age. The same findings were observed in analyses of mothers without diabetes, CKD, and rheumatic disease before pregnancy. In analyses in which baseline was set at 5 yr after childbirth, similar results were observed in mothers without preeclampsia, but the strong effect of preeclampsia on the RR associated with LBW offspring was now weaker, although still highly statistically significant. Cumulative risk for having a kidney biopsy according to preeclampsia and offspring birth weight. Norway, childbirths 1967 to 1998 and kidney biopsies 1988 to 2002. As illustrated in Table 4, predictors of MPGN were not significantly different from predictors of a kidney biopsy. When similar analyses as those illustrated in Table 4 were repeated for women without diabetes, CKD, or rheumatic disease before pregnancy, the analyses yielded similar results. Glomerular deposits were not associated with pregnancy-related variables. Among the 83 women with other immune complex GN, 41 had systemic lupus GN, 18 had membranous GN, 13 had MPGN, and 11 had endocapillary GN. Risk factors for receiving a diagnosis of other immune complex GN were similar as risk factors for having a kidney biopsy, even though offspring birth weight <1.5 kg and gestational age <32 wk seemed to be more strongly associated with other immune complex GN than with the main outcome (Table 4). When the analyses in Table 4 were repeated for women without diabetes, CKD, and rheumatic disease before pregnancy, the effects of offspring birth weight <1.5 kg and gestational age <32 wk and preeclampsia were weaker but remained statistically significant for short gestation and preeclampsia. Of the 41 women with systemic lupus GN at kidney biopsy, six had received a diagnosis of rheumatic disease before pregnancy, among whom only two gave birth to offspring >2.5 kg and did not have preeclampsia. When women without rheumatic disease before pregnancy were analyzed, pregnancy-related variables were similarly associated with later diagnoses of endocapillary GN, membranous GN, MPGN, and systemic lupus GN. This category comprised 28 women with FSGS and 20 with MCD. As illustrated in Table 4, risk factors for the FSGS or MCD category were not significantly different from risk factors for having a kidney biopsy. When similar analyses as those illustrated in Table 4 were repeated for women without diabetes, CKD, or rheumatic disease before pregnancy, similar results were found. The 28 women with FSGS had a significantly shorter duration from childbirth to biopsy than women with the other diagnoses (10.9 ± 9.3 versus 16.2 ± 9.4 yr; P = 0.004). Among these 28 women with FSGS, nine had received a diagnosis during the first 5 yr after childbirth, and six of these had had preeclampsia during pregnancy. Preeclampsia thus seemed to be followed by an early diagnosis of FSGS in some cases. The 179 women in this category included 49 women with an infrequent diagnosis (13 with crescentic GN, six with renal vasculitis, five with thrombotic microangiopathy, two with malign nephrosclerosis, five with diabetic nephropathy, 15 with renal amyloidosis, and three with hereditary nephropathy) and 130 women in whom tubulointerstitial or vascular pathology dominated (50 with benign nephrosclerosis, 18 with acute interstitial nephritis, and 62 with chronic interstitial nephritis). As illustrated in Table 4, risk factors for other pathologic findings at kidney biopsy were similar as risk factors for having a kidney biopsy in general. The effects of these risk factors were preserved when women with diabetes, CKD, or rheumatic disease before pregnancy were excluded, as well as when baseline was set at 5 yr after childbirth. The same risk patterns applied to any of the specific diagnoses included in this category when analyses similar to those in Tables 2 and 4 were performed for specific diagnoses. The 90 women in this category included 68 with normal or unspecific biopsy findings and 22 with unrepresentative biopsy specimens. The number of women in subgroups according to pregnancy-related variables is illustrated in Table 1. As illustrated in Table 4, adverse perinatal outcomes were similarly associated with normal findings or unrepresentative biopsy as with having a kidney biopsy. The effects of these risk factors were preserved when women with diabetes, CKD, or rheumatic disease before pregnancy were excluded, as well as when baseline was set at 5 yr after childbirth. The same risk patterns applied to the two subgroups of this category. Women who had preeclampsia and gave birth to offspring with LBW and short gestation had a substantially increased risk for having a kidney biopsy later in life. Preeclampsia increased the effects of LBW and short gestation. The increased risk in women with diabetes, CKD, and rheumatic disease was expected. That most risk factors were stronger during the first 5 yr after childbirth was striking, although the increased risk persisted for the rest of the observation period. Of great importance is the observation that the associations were virtually identical after exclusion of women with diabetes, CKD, and rheumatic disease before pregnancy, thus keeping the focus on otherwise healthy women. To our knowledge, this is the first cohort study of perinatal factors and their association with later clinical maternal kidney disease. LBW offspring and short gestation were also associated with an increased risk for later kidney biopsy in the absence of preeclampsia, suggesting that placental dysfunction without the development of preeclampsia may be an important risk factor. Placental dysfunction is an important part of the preeclampsia syndrome, which also involves systemic vasoconstriction, endothelial dysfunction, oxidative stress, activation of coagulation, and glomerular leakage of proteins (12,13). Studies have shown that microalbuminuria persists for at least 5 yr after birth in approximately 20 to 40% of women with preeclampsia (3,4), as compared with 2% in those without preeclampsia (4). These findings suggest that preeclampsia and possibly placental dysfunction are associated with irreversible kidney damage that also may explain the findings in our study. In addition, microalbuminuria is a recognized initial stage in the development of diabetic and nondiabetic clinical kidney disease (14,15), and proteinuria is a possible mediator of further renal damage (15,16). That preeclampsia, LBW offspring, and short gestation were stronger risk factors during the first 5 yr after childbirth suggest that preeclampsia or placental dysfunction may accelerate development or progression of kidney disease but may also be explained by the presence of subclinical or undetected kidney disease before pregnancy. Studies have shown that risk factors for atherosclerosis and microalbuminuria from 20 yr of age are similar to risk factors for preeclampsia (17–21). It therefore is likely that women with pregestational microalbuminuria or atherosclerosis will have an increased risk for preeclampsia as well as clinical renal disease. It is also possible that a subclinical GN could be present before pregnancy and accelerated by preeclampsia as GN often have a long asymptomatic period, glomerular immunodeposits may be present without clinical signs of GN (22,23), and hypertension is an important risk factor for progression of kidney disease (24). Pregestational kidney disease would also increase the risk for developing preeclampsia during pregnancy (25). This could not be investigated further in our study because data on microalbuminuria, BP, or GFR before pregnancy were not available. Our study also investigated whether adverse perinatal factors were risk factors for 20 different diagnoses at kidney biopsy. Whereas the total population at risk was very large, the number of women with specific diagnoses was low for most diagnoses; thus, it was necessary to group the diagnoses into categories. The intentions were to focus on glomerular diseases, to obtain categories of a minimum size, and to group only pathophysiologically similar diagnoses into the same category. Such categorizations will always be an object for discussion, but it is our opinion that the chosen categories were suitable and the best compromise available. This study could not identify important differences between risk factors for different categories of kidney disease or for specific diagnoses, which was unexpected. Most likely, it does not reflect etiologic homogeneity of glomerular diseases but rather an aggravating effect of adverse pregnancy-related factors on any kidney disease that could be subclinical or undetected before pregnancy. The major strength of this study is the large national cohort of subjects with complete registration of exposures and outcomes. A weakness is that subjects were included from 1967 to 1998, whereas outcomes were not registered until April 1988. This weakness was compensated for by two approaches and is unlikely to have affected the results significantly. First, those with childbirth after April 1988 were analyzed separately. Second, the statistical method that was used does not include patients in the analyses until an outcome can actually be registered. Statistical adjustments could not be performed in this study without thorough considerations, mainly because variables that were recorded before or during pregnancy were likely to affect variables that were recorded after birth. One example of this is preeclampsia that is an important indication for induction of labor and thus a direct cause of LBW offspring. RR associated with LBW offspring therefore should not be adjusted for preeclampsia, and the major results therefore were stratified for offspring birth weight and preeclampsia. Further stratifications were made for women with and without pregestational diseases. It was essential, however, to ensure that the results presented could not be explained by missing adjustment for possible confounders. In a series of models of adjustment, it seemed that the main findings were independent of maternal age, year of childbirth, marital status, small for gestational age, and stillbirth. Further adjustment for potential confounders such as maternal smoking, socioeconomic status, and maternal body weight was impossible because of lack of data. Thus, the results of our study seem to be independent of possible confounders, but more studies are needed to clarify this issue fully. For reasons of simplicity, we studied associations only of the mother’s first pregnancy, and our results should not be extended to higher birth orders without reservations. Similar associations, however, are likely to occur also in higher birth orders, especially because adverse pregnancy outcomes often are repeated in later pregnancies (26). As data on subject survival were not registered, subject death could not be used as a censoring event; however, this is unlikely to have affected the results significantly. Unfortunately, maternal cigarette smoking was not reported to the Medical Birth Registry during the observation period; therefore, this factor could not be included in this study. Maternal smoking is a possible confounder because it is associated with LBW offspring (27) and progression of kidney disease (28) and inversely associated with preeclampsia (29). Previous studies, however, suggest a modest effect of smoking on the incidence of kidney disease in women (28); and therefore, it is unlikely that smoking was a very important confounder in this study. In addition, adjustments for smoking would increase the RR estimates, at least for preeclampsia. It is a matter of discussion which outcome should be used when investigating risk factors for clinical renal disease. The main benefit of using kidney biopsy as an outcome is that it identifies a fairly homogeneous group with kidney disease, as the disease must be of a certain gravity and a glomerular disease usually is suspected. The major limitation of using this outcome is the large number of subjects with low-grade proteinuria or decreased GFR who will not be investigated by a kidney biopsy. It is our opinion that the benefits outweigh the disadvantage in studies of such large populations as this study and that the risk factors for having a kidney biopsy identified in our study could possibly be extended to risk factors for clinical renal disease in general. This is supported by the observation that risk factors for different glomerular diseases did not differ from risk factors for tubulointerstitial and vascular diseases or risk factors for having a kidney biopsy. Our study has identified preeclampsia, LBW offspring, and short gestation as important risk factors for the mother’s having a kidney biopsy later in life. To our knowledge, this study is the first to document that preeclampsia and possibly placental dysfunction are risk factors for later clinical kidney disease in otherwise healthy women. In the interpretation of the data, one might infer that preeclampsia or placental dysfunction may cause directly or aggravate an already existing kidney disease, but it is also possible that kidney disease, preeclampsia, and placental dysfunction all are caused by the same etiologic factors (e.g., involving a genetic component). Our data cannot shed further light on these two alternative mechanisms. It should be emphasized that our study has analyzed risk factors for having a kidney biopsy and these factors may be different from risk factors for developing chronic renal failure. To clarify this issue, further studies on pregnancy-related risk factors and ESRD therefore should be performed, including proteinuria, GFR, BP, and lifestyle factors before pregnancy. Financial support was offered by the Strategic Research Program from Haukeland University Hospital and the Research Council of Norway and these partners played no part in development or approval of this manuscript. Stein Atle Lie, postdoctoral fellow and statistician, contributed with important statistical advice.